When did you feel an impact? Hey everyone, I’ve been using Chinesepod for about 1 week now and so far I’ve done around 16 lessons at the Newbie level. I was wondering at what point you began to feel like you are really improving as it’s going rather slowly for me. It would be nice if someone could give me suggestions on how they used Chinesepod, I’m a student on my summer holiday right now so I have lots of free time and really want to dedicate most of it on learning Chinese. I would suggest not over exerting yourself to avoid burning out early. From my experience , just a little bit everyday over a longer period of time is better then going crazy for a few months then stopping completely. Just listen to the dialogues and write down the words you need to learn or put them in a flashcards system, and don’t be afraid to enjoy lessons above your skill level. Most importantly, start using the language now. Find a Skype buddy to talk with, and try enjoying some blogs or videos designed for native speakers, even if you don’t understand you will get more used to the rythm and flow of the language. Everyone learns differently so experiment with your method and you will find what works for you. Rome wasn’t built in a day and Chinese wasn’t learnt in 3 months. Also, if you’re a beginner, we recommend you watch the Say It Right series to make sure you get the best start in your Mandarin studies and don’t develop any bad pronunciation habits. 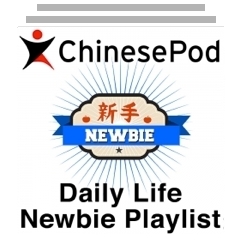 Also, many people like to follow our Newbie Daily Life Playlist which has 45 lessons which will provide you with lots of useful situations and vocabulary. Once you’ve studied around 50 lessons at Newbie, you can start experimenting with Elementary ones, especially the video lessons which make learning a bit easier. Charlie, I probably have only doing this a week or two longer than you. I’ve noticed there is a broad range of newbie lessons, and some of the newer ones aren’t necessarily of the “day one” variety (more of the mid to late first semester type lessons if you’re comparing CP to classroom language learning). You’ll find some very basic lessons on the later pages (page 8-9) of the newbie section if the newer releases are a little too tough at this point. My guess is take a listen to those and you’ll feel you’ve made some great progress already!